Narrow range brix hydrometer that allows for highly accurate measurement. These hydrometers are excellent for use in the middle and towards the end of wine fermentation. It features a built-in thermometer and correction scale for temperature correction of the reading. 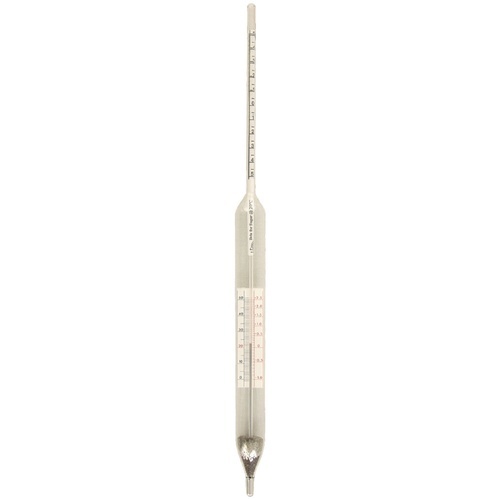 Thermometer measures a range of 30-150 F (0-50 C) with 1 degree resolution. These brix hydrometers are calibrated at 68 F (20 C). A refractometer is great for grape readings or initial brix readings. But when you finish up, a quality narrow range hydrometer is a must. We have some sweet berry wines and this hydrometer is essential in consistently hitting the mark.